By 12pm - After registration, finding a team and a brief intro to the event the hacking commenced. Me and my team now had to decide which challenge we wanted to compete for and come up with some ideas to work on. We were fairly terrible with our ideas and at first we started on some kind of reselling dashboard for the Nexmo API, we made a start on this but found ourselves very bored with the idea and after a few hours of getting nowhere we completely scrapped it in favour of an idea involving an Affiliate Window datafeed. 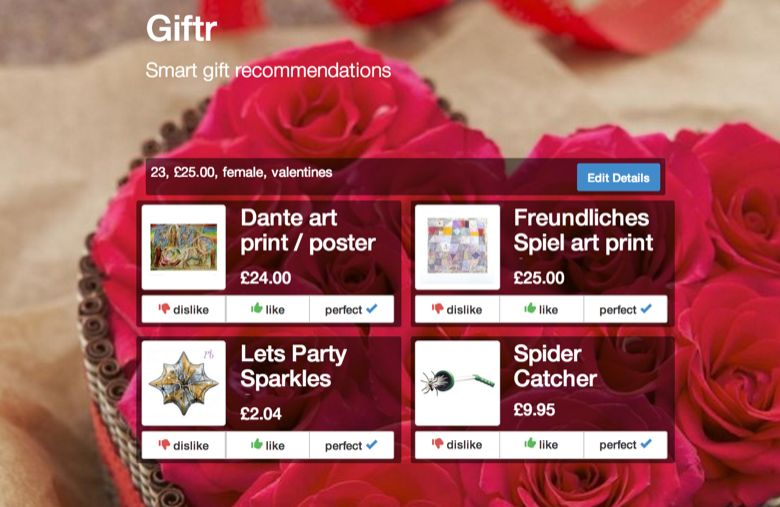 Giftr (Winner of the most original name award) is a smart gift recommendation engine. You enter some details of a friend you want to buy a gift for and it will display 4 products that are (hopefully) related to the information you entered. You can then like or dislike these products which replaces them with a new set of products based on the taste you submitted. 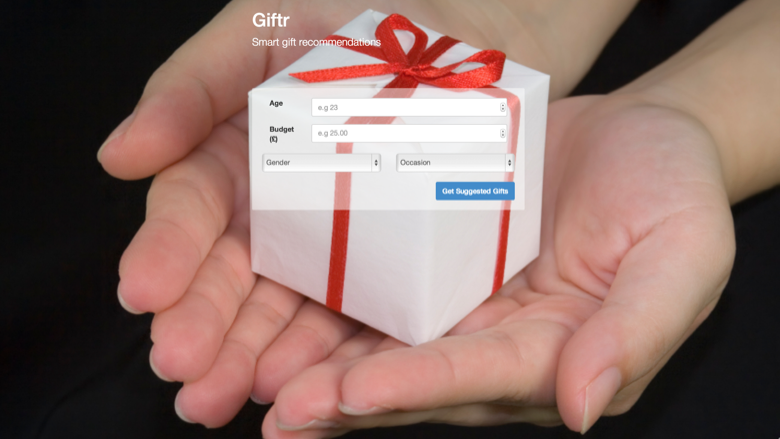 What makes giftr a bit more interesting is that it learns. When you submit your friends information a taste profile is created, this profile is then matched to other similar profiles in the system and 3 of the products are displayed that best fit those profiles. When your likes and dislikes are submitted the system then re-evaluates which profiles you are matched to and how strongly you are matched to them, if you are matched more strongly to any other profiles or if your profile is taking it&apos;s own new route. Profiles taking new routes is important and therefore the 4th result is always something either completely random or something that the system determines is almost completely opposite to what you want. The user should always have an option to go in a new direction! Giftr was fun to work on, unfortunately it is no longer live but I may come back to it and make something of it. A bit of work would be needed to make the algorithm more efficient and for it to scale well - at the moment it gets exponentially slower the more profiles and ratings are in the database :( There is so much that could be done to make Giftr better and hopefully one day it will find a home on the internets. Leeds Hack is a great event and I encourage hackers and sponsors to get involved with next years event - I assume there will be one!